One rule that holds across the universes is the fact that there are not many auteurs named Herb. Therefore, we need to cherish those we have. Perhaps the most accomplished of these unsung heroes is Herb Freed, director of Haunts (1977) and the topic at hand, the classic slasher film Graduation Day (1981). As usual, many of your universe's top critics misunderstand Mr. Freed's genius. Reviewer capkronos writes, "GRADUATION DAY is not a 'good' or original film by any stretch." 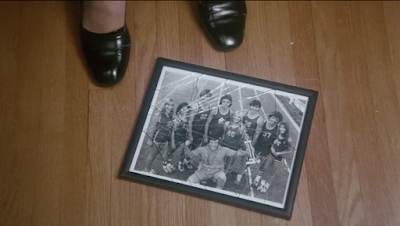 Reviewer FilmFatale writes, "Pretty lame and awful slasher about someone killing the members of a high school track team....Graduation Day fails to deliver on most counts." 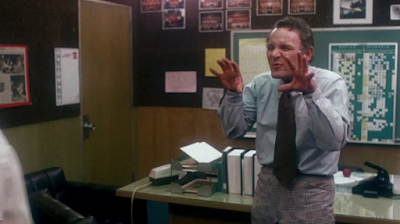 Finally, reviewer rott21, grading the film D-, writes, "This is one of the worst slasher movies that i have seen for a while....so slowwwww and boringggggg." Let us now turn to an in-depth discussion of director Herb Freed's Graduation Day. In the classic title sequence, Mr. 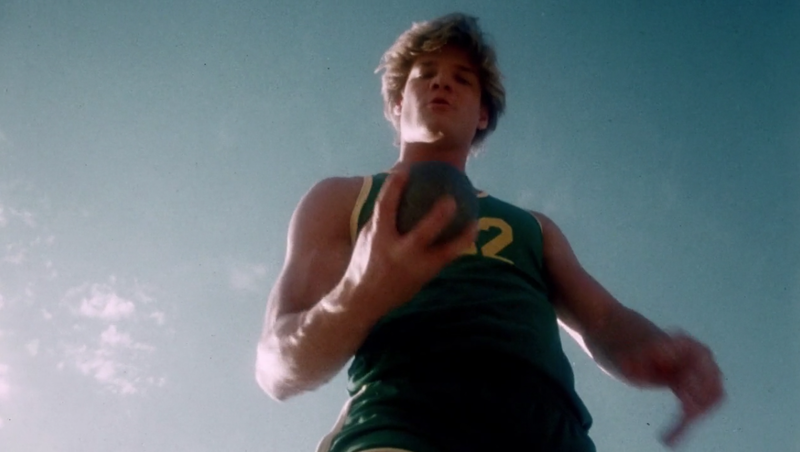 Freed cuts rapidly to the beat of the disco song “The Winner” with its catchy chorus of “Everybody wants to be the winner.” The visuals depict artistic shots of a track meet, some of which occurs indoors and some of which occurs outdoors simultaneously. In fact, the title sequence, from the first shot of a starter pistol to the director’s credit, comprises 290 shots and lasts 4 minutes and 57 seconds, so the average shot lasts almost exactly one second. Quite an achievement. The title sequence track meet prominently features Laura, one of the best runners, as she wins a race. 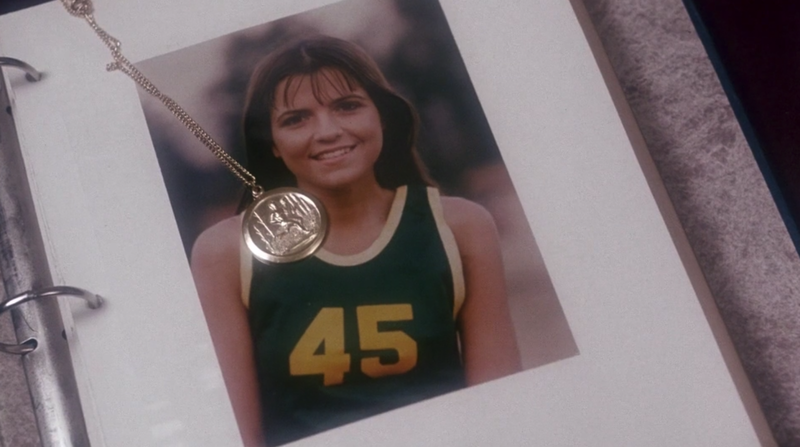 Her coach is played by Christopher George, who helpfully yells, “Move your legs, Laura!” Perhaps such basic advice is necessary, as Laura seems to change her jersey from #40 to #45 and back to #40 during the race. Tragically, the track meet ends in the death of Laura, the star runner of the Midvale High School track team. The film then cuts forward in time to the high school’s graduation day, as Navy officer Anne Ramstead is returning to her home town. She hitches a ride with a truck driver who appears to be the image of a flamboyant purple-shirted gay man from the early 1980s, but the twist is that the driver makes sexual advances toward Anne and grabs her leg. Meanwhile, a teenaged jogger named Paula is running through the woods, unaware she is being chased by a man wearing black gloves and carrying a stopwatch. The man grabs her and slashes her throat with a knife. Not one to take advantage of the occasional trend for “slow burn” slasher films, director Freed cuts straight to the day before the titular graduation day, as partying teens pose for pictures in their caps and gowns. 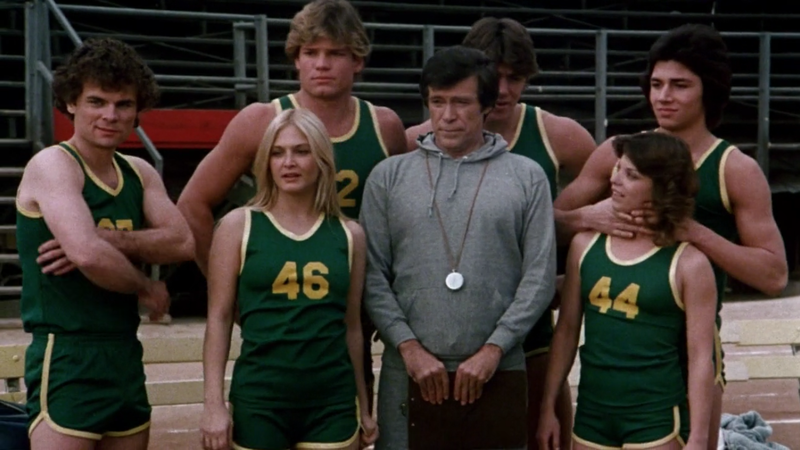 Meanwhile, the track team is ready for their own graduation day photo, but they want to wait for Paula, to the consternation of impatient coach Christopher George. Despite Paula’s absence (and as-yet-undiscovered slashing), Mr. George gets his way, and a fine photo is taken. Continuing at a breakneck pace, Mr. Freed moves on to Anne Ramstead returning to her childhood house, where she greets her mother and her mother’s nasty husband Ronald. The filmmakers quickly cast suspicion on both Anne and Ronald, as we learn that the late Laura was Anne’s sister, and that there was a sizable insurance policy on Laura with Anne as beneficiary (for some undisclosed reason), though Anne does not plan to keep the insurance money. 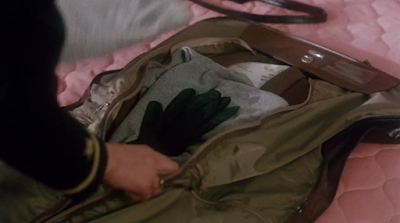 Furthermore, Anne has packed traditional killer’s black gloves in her duffel bag, which we notice as she unpacks in her murdered sister’s room. Could she have returned for some black-gloved revenge? Our suspicions about Anne are further aroused when she smashes a picture of the track team on the floor. Our suspicions about Anne are then alleviated somewhat in the very next scene, in which we see someone with black gloves take the same, though unsmashed, picture from a locker and cross out Paula’s picture with lipstick. “Well, gotta run,” says the girl. We are next introduced to the principal, Mr. Guglione, portrayed with comic flair by prolific character actor Michael Pataki wearing a fashionable checkered suit. In order to understand the reasons behind her sister’s death—and in order for the filmmakers to keep the supply of suspects topped off—Anne breaks into the mansion of her murdered sister’s boyfriend, Kevin. In the front hall of the mansion, she finds a scrapbook documenting her sister Laura’s final race, and in fact the entire title sequence of Graduation Day. 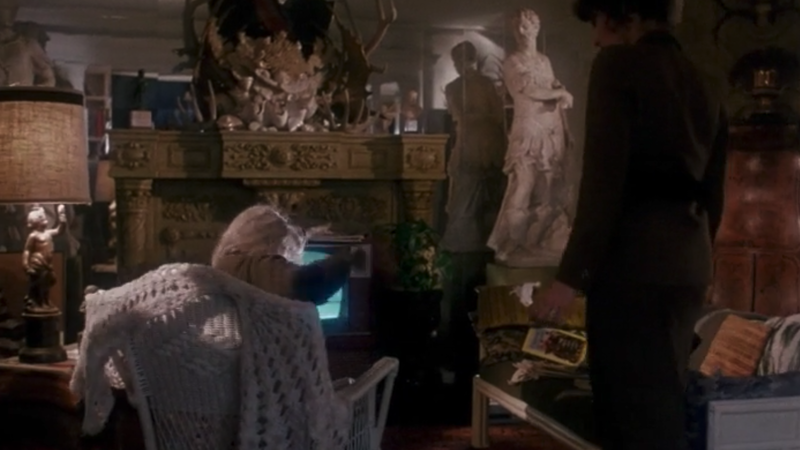 Then she finds Kevin’s demented grandmother sitting in a rocking chair and watching static on the TV, oblivious to everything. “She didn’t have to die, Kevin.” says Anne. She gives Kevin a medallion, meant to be her graduation present to Laura. 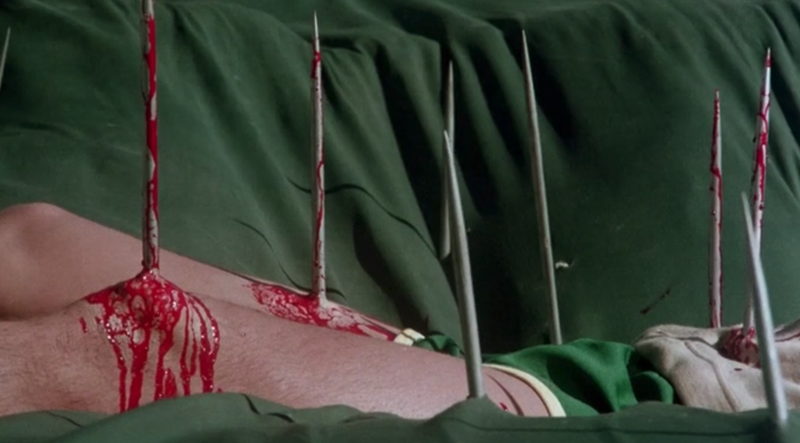 At the end of her routine, however, Sally falls, and is murdered via fencing sword as she shaves her legs in the locker room, allowing the audience to consider whether Mr. George’s perfectionism is the motivation for the current spree of slashing. The sexual shenanigans continue in the principal’s office, as we see that Michael Pataki is having both an affair and a love-hate relationship with his blonde assistant named Blondie. 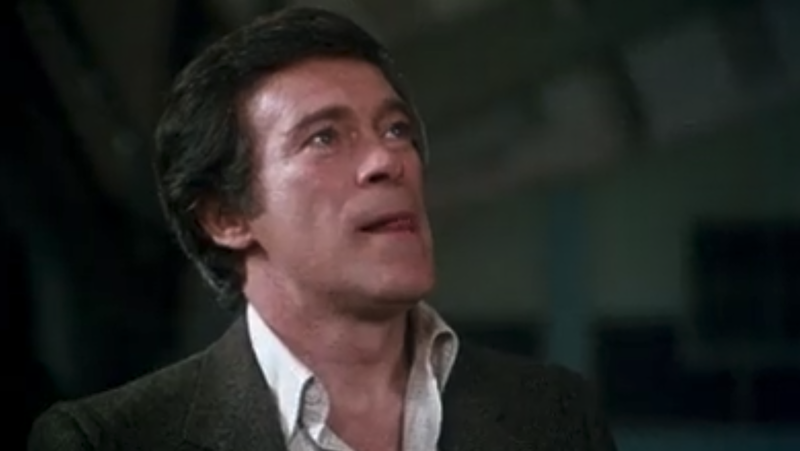 Not to be outdone by Christopher George’s lip-licking, Mr. Pataki punctuates his scene by miming the “honking” of female breasts (though he does this at an unusually high angle). 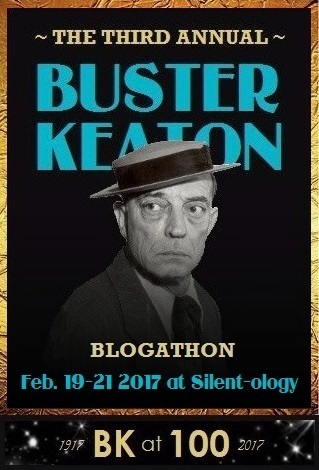 Around the film’s halfway point, we are introduced to another potential killer, the Barney Fife-like Officer MacGregor, who threatens to bust Dolores and her boyfriend for smoking dope, and then smokes some dope himself. Next comes one of the film’s finest murders, as the unknown assailant encounters a football player who is searching through the forest for his lost football. 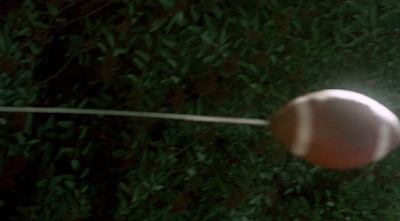 The killer has come prepared with a football fitted in some unknown way with a long fencing sword’s blade. The killer makes a long pass, despite the fact that the killer and the football player are standing only a few yards apart. 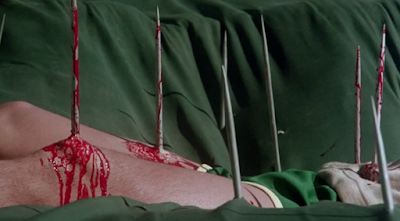 The football player is impaled in the stomach, and the killer continues his routine of switching off a stopwatch and crossing out the victim’s photo with lipstick. Another set piece follows, this one set at a roller skating dance party and featuring a band called Felony. Several stories are intercut as the band sings its song “The Gangster Rock” (twice): a boy and a girl go to the park, another girl bites her boyfriend’s hand as they walk through the skating rink, a girl wearing a bathrobe stumbles on skates. The sequence’s climax occurs when, after urinating outdoors and justifying it with the immortal line “The world is my toilet,” the boy in the park is beheaded by garden shears. When his girlfriend looks for him in the woods, of course calling to him, “Stop turning around,” though he is not in fact turning around, she finds his head and is then chased by someone wearing a track suit and wielding the fencing sword. For reasons known only to Herb Freed, this part of the sequence is sped up, perhaps an homage to the Keystone Kops or to the Banana Splits. She too is murdered. As the track team continues to disappear, their parents of course call principal Michael Pataki instead of the police. Mr. Pataki brushes off the parents’ calls, though he does notice that all the missing kids are from the track team. 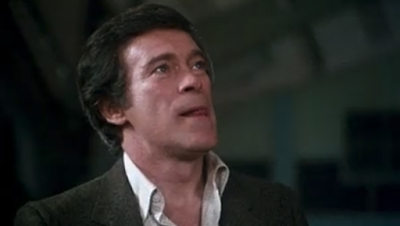 “I’m Lebanese,” responds Inspector Halliday. “You look Italian,” says Mr. Pataki. While the rest of the students are in their caps and gowns, preparing for the graduation ceremony, one of the boys on the track team is on the field, practicing his pole vault, with unfortunate, H. G. Lewisesque consequences. The third act begins when the first body is discovered in a gym locker. Christopher George’s Coach Michaels investigates the discovery of the body, but the foolish girls in the locker room (one played by Vanna White) jump to the conclusion that Mr. George was the killer. This results in a fight between Kevin and Mr. George, who exhibits Shatner-level fighting skills, and then a chase. Kevin catches up to Mr. George in the woods, where Mr. George tries to explain he never killed anyone. 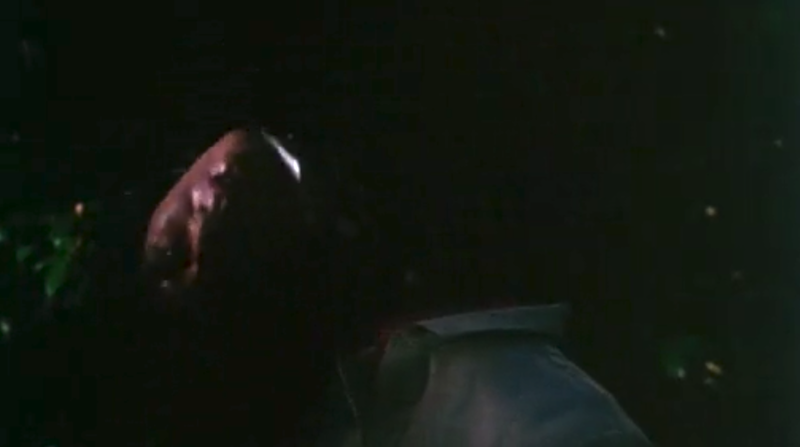 Immediately, Kevin confesses to being the killer, and explains that his motivation was his girlfriend Laura’s death during the opening track meet. Kevin pulls a knife out of his boot and explains he has been using his stopwatch to time each of the murders because Laura died 30 seconds into her final race. Instead of running away during Kevin’s monologue, Mr. George uses judo to disarm the killer, but shockingly Inspector Halliday shoots the coach without provocation, assuming Kevin was the victim and Mr. George the killer. Within the space of a few minutes, Anne Ramstead becomes suspicious of Kevin and breaks into his house again. She realizes Kevin was the killer when she enters his bedroom to find a Vampirella poster, a sword displayed on the wall, and the decaying body of her sister sitting in a chair. Kevin suddenly grabs Anne and explains he plans to marry Laura’s corpse after graduation. When she does not react happily, Kevin grabs a tiny knife, despite the abundance of swords and other weapons in the room. Anne presumably uses her Navy training to duck behind a chair and push it toward Kevin. Of course, it is Laura’s chair, and her corpse is propelled against Kevin, knocking both of them out the second-story window. This double defenestration fails to deter Kevin, as he carries Laura back into his house while Anne runs outside. In a clever parallel, Anne runs to the high school field, and director Freed intercuts Anne’s running with Laura’s final race. 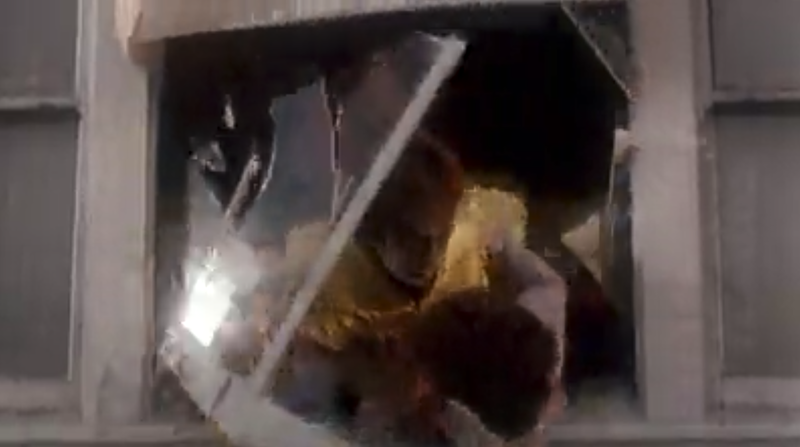 The finale is a slightly confusing chase under the bleachers as Anne repeatedly and awkwardly uses karate on Kevin, and finally pushes him into the spikes that killed the pole vaulter, which are now vertically attached to the door of a shed, along with the pole vaulter’s body, for unexplained reasons. In perhaps the biggest shock of the film Graduation Day, the graduation ceremony is never shown, as the fate of the killer is wrapped up well before the ceremony begins. "HERB FREED started his adult life as an ordained rabbi and became the spiritual leader of Temple Beth Shalom in Lake Mahopac, New York while producing and directing three shows at the Maidman Playhouse in New York City. Eventually, he resigned his pulpit to become a movie director. He has directed and produced 15 feature films most of which have had psychological, spiritual and/or social themes in spite of their commercial categories. 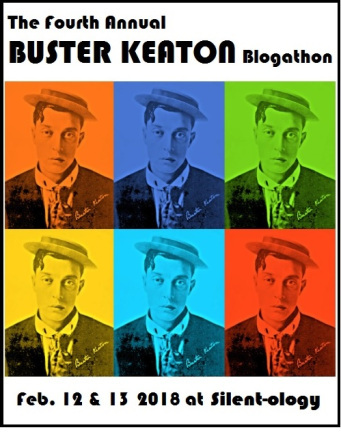 He is best known for Graduation Day, a horror film, and Tomboy, a teenage romp, as well as the psychological drama Haunts, and CHILD2MAN, a story of survival during the Watts riots." not the least of which is the effect that losing scissors has on fragile women. Certainly, his films Beyond Evil (1980), Tomboy (1985), and Dead Punks (1999) are milestones of culturally sensitive cinema. Graduation Day itself, while following closely the structure and beats of the early 1980s slasher film, subverts our expectations in many ways. For example, the title sequence and the musical sequence at the roller disco are edited so frenetically that they quickly place the viewer in the chaotic emotional space of a slasher film. For another example, the protagonist of the film, Anne Ramstead, begins her investigation of the nasty goings-on in town, but then disappears for the middle section of the film. The viewer is again invited to feel as if he or she is truly inside the slasher film, as there is no other central character with which to identify. In the end, however, what makes Graduation Day a classic is the inspired presence of two of charismatic, experienced, and inimitable actors: Christopher George and Michael Pataki. Both of these gentlemen, now unfortunately deceased, turn in wonderful but disparateperformances in Graduation Day. 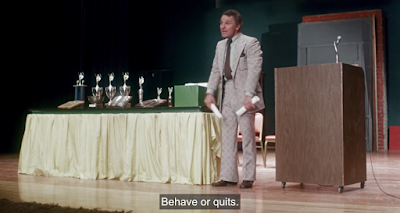 Mr. George, the put-upon coach and prime suspect, is tense and nervous throughout the film, berating his track team and licking his lips as he watches his gymnast perform her routine. Mr. Pataki, on the other hand, plays his principal role more broadly and comically, providing just the balance the film needs to sustain the viewer's interest for 97 minutes. If it weren't for these two talented gentlemen, and Herb Freed as well, Graduation Day would not be the high water mark of slasher cinema for which it is recognized today.